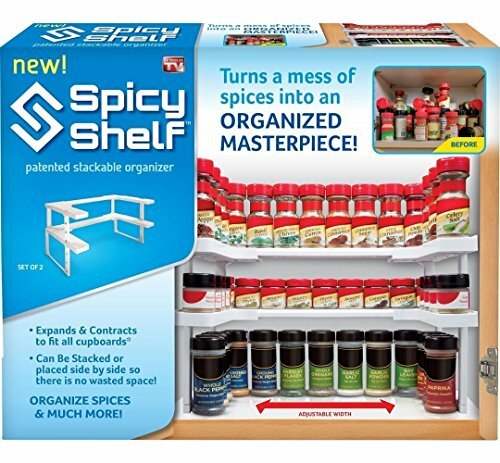 The spicy shelf kitchen cabinet organizer turns a mess of spices into an organized masterpiece it installs in a snap – no tools required. Spice rack fits any cabinet. It’s fully adjustable to fit many different sizes. Each spice shelf can be adjust to as narrow as 7.5″ to as wide as 17″. The depth of the shelf is 10 3/8″. I bought this for my husband for Christmas. The insutrctions is comes with is NOT in English so you have to rely on the pictures. What should have taken me 15 minutes to put together took an hour and a half. Then after all that and putting it into my cabinet and organizing it we returned it a week later. The bottles fall off and they are so close together that you still can’t see what they say. Waste of time and money. DO NOT BUY THIS!!!!! Not only are they great for spices, but work great anywhere. Try them in your tool shop to hold small jars of nails and things. This would have been better if it was deeper. It looks like it was made for 12 inch deep cabinet. Mine is 15 inch so you have to reach way in to retrieve. Also, doesn’t hold as much as I expected. Plus I have some larger spice containers. It would be better if you could use longer legs. Comes with two size legs, not long enough and too short. Picture on box show all small and medium size jars. The cabinet shelf pins were spaced for a 15 inch shelf so the 10 inch rack wouldn’t reach. Otherwise I could have had more flexibility in placement. Boy this would be a asset in my house they are scattered everywhere in the spice cupboard. This will be one way of cleaning up the mess!!! organization is the key to a happy household. these are a well made easy way to organize your spices. the best thing since sliced bread. A recommend and a must have in my opinion. The Spicy Shelf Spice Rack and Stackable Organizer saved my cabinets and me!! When I decided to get mine, my cabinets were a mess and I would get so stressed and frustrated trying to find a certain spice. At times my husband would find them for me, mainly because he was the one that would just put them in the cabinet with no organization at all. With this, there is FINALLY some organization in my cabinet and it made more space for other stuff. AND with this, my husband actually puts them back where he got them from!